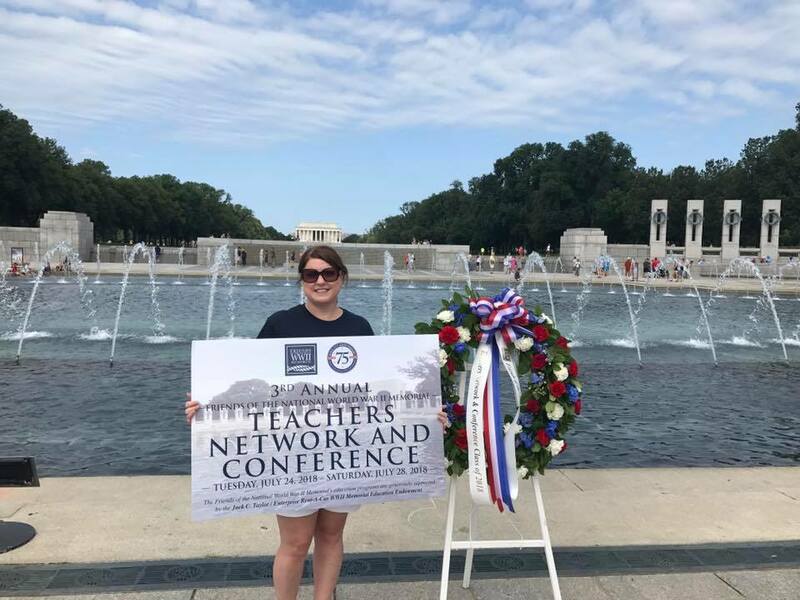 Great Wars teacher Erin Coggins stands before a wreath she helped to present at the Friends of the World War II Memorial Teacher Network. She honored her grandfather's service during the convention. From USO simulations to music sessions, history teacher Erin Coggins finds multiple ways to keep her students interested in the material they learn. While often these “little” things go unnoticed, former student Camille Herren appreciated the extra effort put forth by Coggins enough to nominate her for the Gilder Lehrman National History Teacher of the Year. After winning at the state level, Coggins has now advanced to the National competition and will compete against nine other teachers for the national title. Coggins could not believe that she had advanced to be a finalist. In fact, she was in awe that she had won state. Coggins students believe she is more than deserving of the award. Herren, who nominated her says that she made the material interesting to learn about and really made the students feel like they were in the time period itself. Becoming a finalist was a complicated process. First Coggins had to compete and win against dozens of people at the state level. After she was nominated, Coggins was sent a list of things she had to do which included a resume, a two page essay on her philosophy of teaching, and a lesson plan using primary sources. She received notification of her win at state in June and her finalist placing in October. “Then we had to turn in a full project, it had to be 15 pages long. So I had to use student work, and so I used our study of the homefront from studying diversity, to creating websites on homefront topics to our culmination project which was the Wings over Courtland event that we did in April of last year. My students dressed in period costumes and we spent the day in Courtland sharing 1940s history with the community” Coggins said. Her current students love the way she teaches the class. They think Coggins has a way of making history “pop” and make even the less interesting subjects fun to learn. “She would make it seem just as if it was happening around you” senior Sam Styes said. If Coggins wins the award she will travel to New York City in October and attend a ceremony at the Yale Club and will be awarded a $10,000 check. Coggins feels she was recognized by the judges because she brings history to life. “You know my philosophy, I’ve talked about how I don’t do textbooks at all. We focus on written words of people, which I think brings history to life, but also those little projects I love to do. Simulations of standing in a bread line to you know, the whole Wings over Courtland project. So as much as possible I like to put students face to face with history or creating history, interviewing veterans, you know, anything like that, talking to their family members. So I think that’s probably a big reason why my packet was chosen, I hope so anyway, I hope it showed that I have that passion of bringing history to life” Coggins said. Herren felt there was no competition in choosing to nominate Coggins. She felt engaged in the subject in many different ways, and that Coggins made it very clear she put focus and dedication in their learning.